It is widely accepted that people should avoid extended periods of computer use without breaks. The actual details do differ from country to country and in some countries, there are regulations that entitle you to breaks from your computer screen. However, general guidance is to take a 5 to 10 minute break every hour. 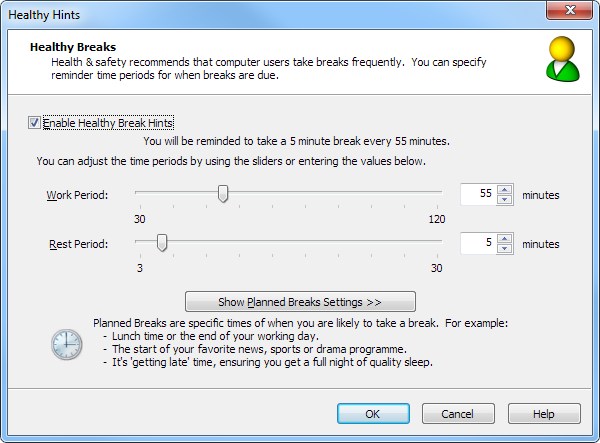 To turn on notification about when breaks are due, check the 'Enable Healthy Break Hints' option. This then allows you to set the frequency of your breaks. This is the length of time you are happy to be working without taking a break. Either move the slider or enter the number of minutes desired. This is the minimum length of time you wish to have a break from your computer. 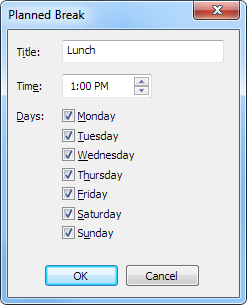 This feature allows you to specify certain times of the day that you are likely to want to take a break. These are used both as a general reminder and as information when a, 'You are tired', notification is displayed. For example, if you specify that your 'Lunch' is at 1 pm and a reminder to take a break appears at 12:50 pm, the message will inform you that there are only 10 minutes until your planned break and give you the option to suspend further reminders until that time. The end of your working day. The start of your favourite news, sports or drama programme. It's 'getting late' time, ensuring you get a full night of quality sleep. Once you have chosen your preferred break frequency period, Healthy Hints will then watch your keyboard and mouse activity looking for a period of rest matching your setting. If that period of rest is not detected within the work period, a reminder for taking a break will appear. If you ignore this reminder and continue to work, your achievement rating will slowly decrease and you will be reminded every 5 minutes. This reminder also offers the ability to suspend further notifications or restart your work period, should you be working on something important or believe you are rested. Once you have taking your break, you achievement rating will be increased.